As mother Earth becoming more polluted, people are more cautious to what they eat and what they drink. To address these concerns, equipment called whole house reverse osmosis system had been brought to the market. In fact, it was introduced in 1960s, and only now becoming more popular because more and more contaminants are becoming present in our water source. People came to realize the benefits of drinking purified water. A Whole House Reverse Osmosis System will remove up to 90 percent of bacteria, viruses, heavy metals and other contaminants. This process of reverse osmosis which forces water through a membrane produces two types of water. One is permeate, which is purified water we are looking for and the another is byproduct – wastewater produced during the process, called concentrate. Whole house reverse osmosis system is highly recommended to those with high chloride, TDS, salts, iron levels in their source water like private wells. The main application of this whole house purifier is on wells with very high TDS or Total Dissolved Solids levels. High TSD levels make source water hard to treat, have very undesirable salty taste and very harsh on all the home appliances. There are wide ranges of economical and well designed whole house reverse osmosis systems. Certain issues are present in cheap low quality models. High pressure systems are very noisy to operate. This is not a problem with low pressure systems that use high quality booster pumps. Every time water is used, the system will automatically turn on to fill the tank. If you use around 120 gallons per person of water for showering, tooth brushing and flushing your toilets, you will have a two (2) hour booster pump run while water is being purified. And if you use water often, you will probably have a four (4) hour or longer pump run. Therefore, it is highly recommended that it should be placed away from bedrooms and high quality efficient pumps are used. The second issue would be its cost. As to the price of this whole house reverse osmosis system, it varies as to the quality of system components and your needs. 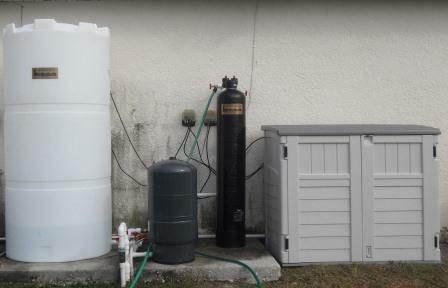 Basically you will need a holding tank, booster and house pump, and a pressure tank to feed the water to your home. Because the system produces less purified water that you use in your home the holding tank is used to store water ready for use. So you will run two (2) pumps besides your well pump, one will provide water to your house and the other will boost pressure to adequate level for whole house reverse osmosis membrane. Some low quality systems will require pretreatment such as softener. If the membrane is maintained correctly, you will have to replace it every three (3) to five (6) years. It is suggested that you should have an analysis done first before you jumped into a decision of which system you will buy. The last issue you will have to deal with is high TDS of waste water. The waste water will need to be drained away from the well to prevent high TDS water from going back to the well. Over time this might cause a drop in overall quality of well water. As a total, whole house reverse osmosis system surely gives you best possible water throughout your home. Though some may find the system costly, it is the only practical solution to some water problems.